The working title was Techno Pop, and this was to resurface in 2009 when the album was re-released as such. But until that date, we knew it as Electric Café – a long playing record that came out in both English and German language versions, as well as a limited edition Spanish language pressing. One of the beauties of the band’s music is that they often sang in several languages in a single song; check out Numbers from Computer World for proof of this. As with all Kraftwerk releases, the original German version always sounds the best; not just in the way the timbre of the language matches the music, but sonically too – so the ‘Deutsche Version’ is the one to have if you can find it. Actually, the choice of language is less critical to Electric Café than with Man Machine or Computer World, though. That’s because this album is texturally more complex and multilayered, relying less on the vocal lines for its power. No Kraftwerk long player is ever simple, but this represented a high watermark. Still distinctively Kraftwerk, but here was an album of pristine, digital perfection. Gone were the noisy tape edits you heard on Man Machine, it was an immaculately polished production with glass-like translucency. Electric Café sounded cleaner than any previous Kraftwerk recording, and made every other contemporary band of the eighties sound rough as frayed old rope. Listening to this album at the time of its release was like voyeuristically peering through a window to the future. It’s hard to understate this feeling, but no less true. In 2015, Electric Café still sounds special. Although recorded onto analogue master tape, it was produced almost completely with digital synthesisers, absolutely state-of-the-art at the time. A few bands had started using such things, but no one had heard anything as polished, multi-layered or cohesive as this. You would find a few American pop-rock acts using a chiming Roland D50 or Yamaha DX7 to do the lead keyboard riff, but Kraftwerk’s use of the technology took things to an altogether higher plane. Recorded in Dusseldorf with an Emu Emulator II sampler and various digital effects processors, and edited together with geometric precision, it sounded like nothing else heard before. Most striking is the band’s use of textures and rhythms; in this sense it shares much with classical music. Many songs also use a lot of sounds from other tracks too, further adding to its symphonic feel. We also see the band using more spoken phrases, repeated in a percussive way, for the first time. The A-side is one long instrumental, each of the three songs seguewaying into the next. The B-side returns to the more conventional pop style of three seperate songs, and interestingly The Telephone Call is the only song ever to have electronic percussionist Karl Bartos on lead vocal. Indeed this gives us a flavour of what he would go on to do with his solo project, Electric Music, a few years later. The subject matter in the lyrics is a kind of bricolage of thoughts and feelings loosely based around mid-eighties European living. From “synthetic electronic sounds, industrial rhythms all around” to the loneliness of dating (“You’re so close, but far away”) and the zeitgeist of the time (“image synthetique, forme aesthetique, a l’age politique, a l’age electronique”). More than anything else, they serve to underpin the mood of the music itself – to heighten its ambient feel. 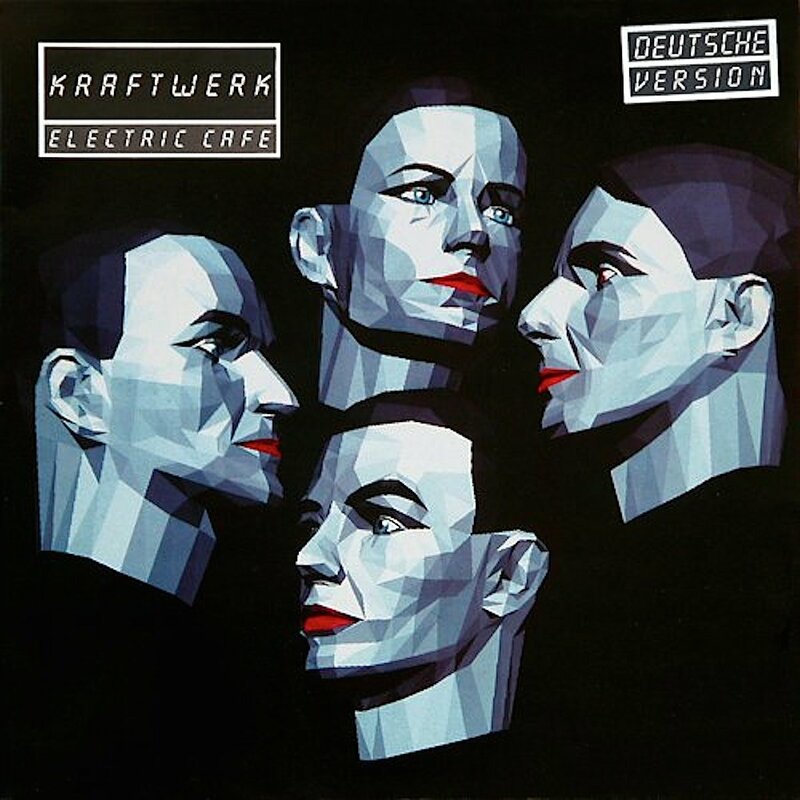 The various, well documented, goings-on leading up to the release of Electric Café have almost overshadowed the album itself, which is a shame because arguably it contains some of Kraftwerk’s best work; it is certainly no less interesting or innovative than anything the band have done before or since. It’s a bit more sporadic and less of-a-piece that any of their great nineteen seventies waxings, but still arrestingly beautiful, highly immersive and incredibly powerful. In a way its sin is to still sound modern; strikingly futuristic when released, it hasn’t aged as obviously as the recordings that came five or so years before it, and doesn’t quite have their quaint, period charm. Still, the songwriting is brilliant, the lyrics clever and production practically peerless. It’s not the obvious, ‘go to’ Kraftwerk album, but it’s none the worse for this. Wait another few years, and the rock commentariat will doubtless re-evaluate Electric Café into being “the personification of post-modern pop” or suchlike – and the best thing the band ever did.